between 2 and 100 guests. Catering for the reception is available for up to 150 guests. Facilities for conferences and meetings (up to 100 delegates). Family-run small hotel with a relaxed atmosphere. 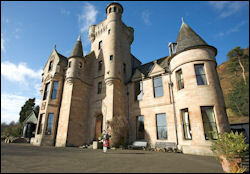 Baronial mansion built circa 1874 in the style of Balmoral Castle. 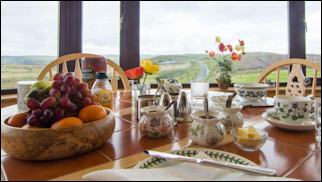 Set on the slopes of the Ochil Hills with fine views. 20 minutes drive from Gleneagles. Only 1 hour from Edinburgh. 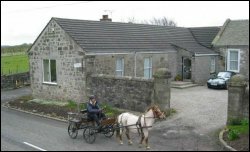 7 double, 1 twin/family room & 2 four-poster rooms. Ideal for romantic breaks, weddings & honeymoons. Lounge & bar for drinks, coffees & liqueurs. offers luxurious, stylish boutique accommodation. Centrally situated. 11 miles south of Stirling. Glasgow 18 miles. Edinburgh 35 miles. 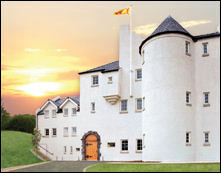 adjacent award-winning Glenskirlie House Restaurant. Choice of 15 individually decorated bedrooms and suites. Wi-Fi access, tea/coffee, mineral water. Dinner, B&B prices from £97.50 per person. 1 ensuite bedroom with a superking double bed and 1 single bed..